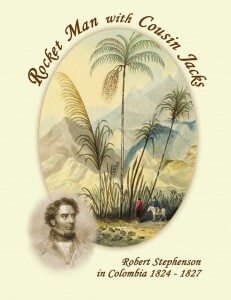 This book reveals for the first time in nearly 200 years the details of Robert Stephenson’s great Colombian adventure. It sets out the reasons behind his decision to abandon his father George, his friends and the management of the embryonic locomotive factory in Forth Street, Newcastle upon Tyne which bore his name and of which he was the Managing Director, for a speculative venture in South America in which he would be responsible for finding and extracting silver from mines first started during the Spanish occupation. The year was 1824 and he had yet to reach 21 years of age. Robert did not return to England until 1827, but that event triggered a burst of creative energy and flair for a series of ground-breaking locomotive designs, starting with the ‘Rocket’ in 1829 for the competitive trials for the choice of engine for the Liverpool & Manchester Railway which his father had engineered and constructed in his absence. The narrative uses many extracts from Robert’s original letters to his boss Richard Illingworth, who was based in Bogotá, courtesy of the University of Indiana, whose Lilly Library holds the originals. They describe vividly the difficulties he encountered, the anxiety he felt about what was happening in England in his absence, the problems of managing some of the workmen all of whom were from Cornwall, the lack of materials, the regular bouts of illness, and the frustration with the Mining Company in London who questioned his judgements. On the journey home he was shipwrecked and very nearly drowned. The character of one of England’s greatest mechanical and civil engineers cannot be fully understood without appreciating the impact his three years in Colombia had on him. In his lifetime he played down the trials and tribulations, but this new insight is essential reading for anyone who wishes to understand how great men use adversity to advance their creative brilliance. The book is illustrated with the water colour paintings of Charles Empson, who accompanied Robert as an interpreter and companion. His own anecdotes have been included as a counter-point to Robert’s more formal correspondence. Most of the mineworkers were from Cornwall, and there are many references to them, not always flattering. The book describes their circumstances in the 1820’s and explains what attracted them to sign up for 3 years and embark on a voyage to a far-away country. Anyone who might have had Cornish ancestors in Colombia should read this. 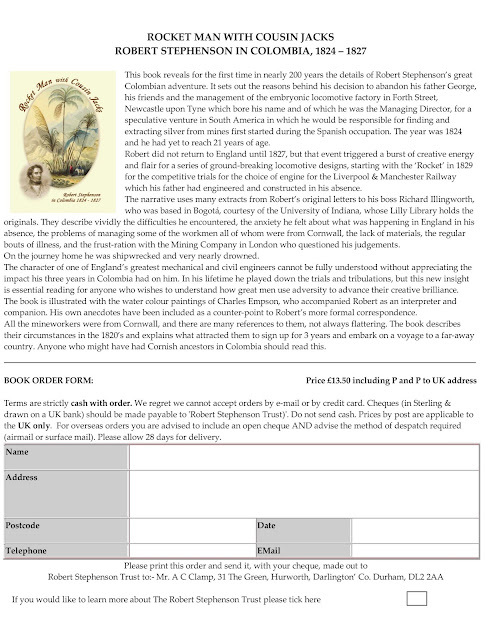 This new book about the great civil and mechanical engineer Robert Stephenson, reveals for the first time the full account of his 3 years in the northern part of South America – mainly Colombia - as a mining engineer between 1824 and 1827. Bob Longridge, chairman of the Robert Stephenson Trust and author of the book said 'It is based on 111 letters from him to his boss in Bogotá, Richard Illingworth. The correspondence reveals an extraordinary series of challenges and frustrations with which he had to contend at a time when the country of Colombia was just recovering from a brutal war with the Spanish rulers - won by Simon Bolivar – and from a series of devastating earthquakes'. 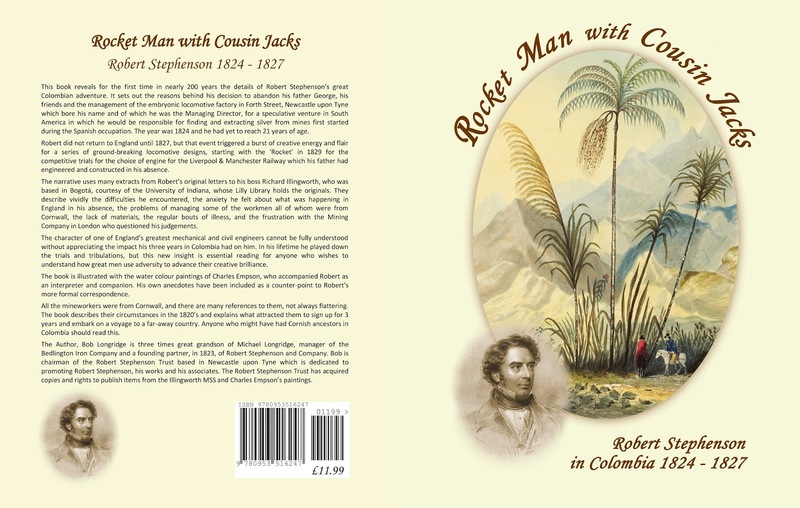 This new book about the great civil and mechanical engineer Robert Stephenson, George’s only son, reveals for the first time the full account of his 3 years in the northern part of South America – mainly in Colombia – as a mining engineer between 1824 and 1827. He was only 20 when he set out for La Guayra (Venezuela) from Liverpool in a brig the Sir William Congreve. It is based on 111 letters from him to his boss in Bogotá, Richard Illingworth. They have been in the collection of the Lilly Library, part of Indiana University in America, for years but no previous biographer had consulted them. The book includes substantial extracts from the letters, a selection of the writings of Stephenson’s companion Charles Empson who describes the life they lived at a time when the land was covered in ancient trees and still had a huge variety of wildlife such as monkeys and parrots, and a chapter on the life of Cornish families at that period. It is illustrated with reproductions of a series of Empson’s beautiful contemporary watercolours plus photographs taken by the author on a recent visit to search for remains of the principal mine where Stephenson was based, near the town of Mariquita. Copies will be available after the launch from the Mining Institute.